Batteries - the heart of a back-up power system? If inverters are the main brain to a power system, then batteries are the "heart" of such a system. While the rest of the system will require little maintenance, batteries require constant monitoring and regular maintenance. It is said that "few batteries die - most are killed" by neglect and poor maintenance. Sad but true! Below is some very basic information on battery care. This information is not for gel-cell, NiCd or alkaline batteries, which will have different maintenance requirements. MAKE CERTAIN you know what batteries are in your system, and their requirements. They are too expensive and hazardous to take their care and maintenance lightly. The battery cabling connections should be kept clean and tight at all times, and inspected at least annually. Anti-corrosion chemicals can be used to keep them clean and fit; petroleum jelly works well. All new batteries should be fully charged prior to use. New batteries need to be gently cycled several times before reaching full capacity (20 to 50 cycles, depending on what kind of batteries you have). Like a new car, do not work them too hard during this "breaking-in" period. Always wear protective goggles and gloves—and old clothes—when maintaining your batteries. When maintaining your batteries, it's not a bad idea to cover all the batteries with canvas or an old blanket, save for the battery you're servicing. A dropped wrench could change your perspective REALLY quickly! Use only distilled water to replenish batteries. Add distilled water AFTER charging; the plates should be covered by approximately 1/8" of acid. Check levels after charging. The acid level should be 1/4" below the bottom of the fill well in the cell cover. Batteries should never be discharged below *80% of their rated capacity. Shallow cycling of your deep cycle batteries will promote battery longevity (*some batteries can be regularly taken to an even greater depth of discharge without damaging the plates). The maintenance requirements of older batteries change. This means longer charging times, and probably higher finishing amperage. Older batteries will need more water, and their capacity will decline. Avoid charging at temperatures above 120°F or higher! And be careful above 100°F. The ideal temperatures for batteries are 55-80°F. In below freezing temps it will take more power to charge your batteries, as cold batteries have a greater self-discharge rate. Liquid lead-acid cells should be protected from freezing. At high temps gassing is excessive and you may have to add more distilled water to maintain your cells. Batteries basically like the same temperatures that we do. Too hot or too cold is hard on them! All deep cycle batteries (excepting gel cells or certain glass mat technologies) should be equalized on a regular basis. This is a "controlled overcharging" which removes sulfates off of the plates and mixes it back with the electrolyte. It helps keep individual cells in balance. A battery bank should be equalized at least every three months; certain electronic regulators automatically equalize your batteries every two to four weeks. Some manufacturers feel that heavily used batteries should be equalized once a week to once a month. Equalizing produces gassing--which consumes water; add distilled water as needed after equalizing. Where multiple batteries are in series, parallel, or series/parallel, do not mix batteries differing in age, size or usage level. Your best batteries will operate only at the capacity of your poorest or oldest cells. When purchasing batteries, plan on their longevity, and upgrade as needed at the end of their expected life span. If you add new batteries to old, expect them to perform at the capacity of your poorest or oldest cells. Do not equalize sealed or gel-type batteries! Their upper voltage range is around 13.8 to 13.9V. Higher charging rates will shorten their life span significantly--or just kill them quick. Use a hydrometer—a tool to test the specific gravity of each cell in your battery—to give you an indication of the quality of each cell and true charge level. A good time to do this is after equalization; a written record is handy, to compare results with previous equalizations and to keep an eye on any cells that may be a problem in the future. A weak battery can cause premature failure of companion batteries--or simply pull the efficiency of your entire system down. If you don't check and maintain your batteries, you will never know what problem cells you may have. Don't call your service person about a problem without a basic check of battery condition. Match your voltage charger to the size of your battery bank; you will not be happy with the performance of an undersized charger, and an oversized charger can cause excessive heat and gassing—and even a deadly explosion or other problems. With certain grid-tie applications, folks are using a minimal battery bank with a utility-tie sine wave inverter. Make sure you are really taking care of your batteries--they are the buffer between your DC charging sources and utility power. Bring your lead acid batteries up to full charge as soon as you can; using them in a partially discharged condition will compromise their longevity and reduce their capacity. If you are using your batteries hard in a home power system, they should be brought up to a full state of charge at least once to twice a week. 1. Completely charge the battery before storing. 2. Remove all electrical connections from the battery. 3. Store the battery in as cool a place as possible—but not below 32°F. The colder the temperatures, the more the rate of self-discharge. 4. When not in use, boost with a charge every two months or so; or, buy a small (10 watt or less) solar module (per battery) to "trickle charge" your battery. Batteries like the same temperature range we do; extreme temperatures can negatively affect battery performance and charging. Cold reduces capacity and retards charging. High temperatures increase water usage, gassing, and can result in extremely unsafe conditions. When a battery is charging, hydrogen and oxygen are being liberated. These gases will burn—explosively! Keep matches, cigarettes, fire and sparks of all kinds away from a charging battery. Sometimes batteries are kept in the power shed with a generator---make certain one doesn't ignite the other. Proper venting of both parties will prevent problems. Liquid acid batteries emit hydrogen sulfide gas; they should be in a vented, enclosed battery box. A pipe or stack coming out of the highest point of your battery box will suffice; the taller the pipe, the greater the "stack effect". Passive venting will work fine in a well designed box, as the hydrogen gas is lighter than air and will naturally rise to the highest point in the box. We have some "generic" battery box designs we can mail or fax you. Do not place any electronics directly into the battery box, as the fumes are corrosive. Exercise extreme caution around batteries. Keep children, pets, and stupid people away from them. For "how to size your battery bank", see information at the bottom of the page. and our new Iron Edison Battery. There are more Surrette Rolls Series 4000 and 5000 Batteries available, please call for further information. Surrette Rolls are made in Canada. These batteries feature the use of the thickest plate, highest density active material in plate construction; their service life averages ten years. They have an increased liquid reserve--which makes for less maintenance. 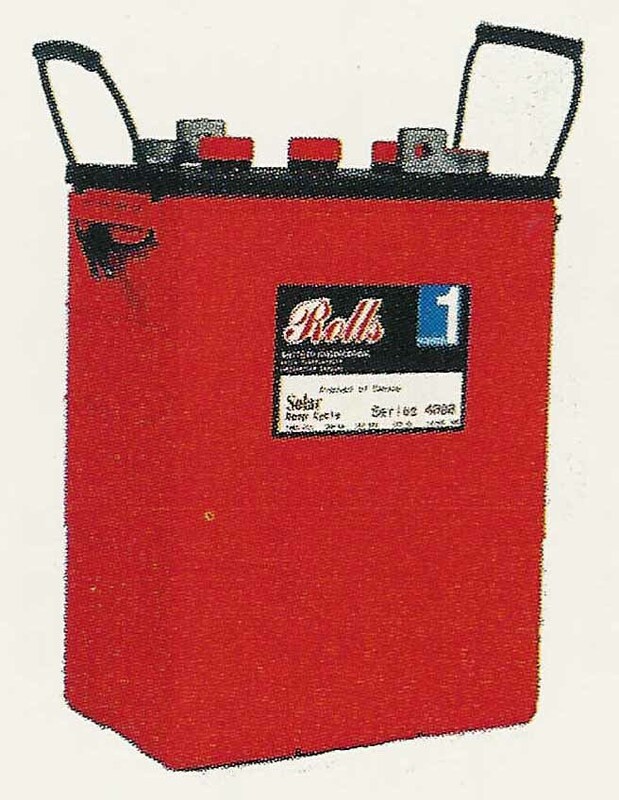 Rolls Battery Engineering has been making batteries for more than 60 years. These quality units are suitable for back-up power for residential applications, as well as remote monitoring stations, navigation aids, refrigeration, and uninterrupted power systems. The maximum number of batteries to safely series/parallel is 16. If you need more batteries to meet your storage needs, consider the 2V cells. Call us if you have questions about this. Seven year warranty, the first two years full and the next 60 months prorated. Replacement batteries do not ship freight free. Other 6V and 12V batteries are available; let us know your project specifications! These may have as long as a 2 to 3 week lead time, but usually less. These are the crème de la crème of long lasting batteries. Despite their initial cost, because of their longevity they are the best deal, dollar-per-amp hour. They offer a five year warranty and generally last 18 to 20 years in a back-up power system--sometimes as long as 25 years--with proper cycling and maintenance. The cell is high capacity industrial type for deep cycle applications and high recovery characteristics. Heat seal cell cover to eliminate the major source of electrolyte leakage and thereby reducing corrosion buildup. Sealing compound around the edge of the case and cell to reduce the problem of electrolyte starting the corrosion process at the edge of the steel case. Powder coat paint is standard; it is highly acid resistant and tough. Lifting handles are provided for ease of handling and transport (whew!--if you've ever moved these big guys, you know what a boon this is!). Batteries can be discharged to 80% of rated capacity with no plate damage. Heavy charging will return battery specific gravity level to approximately 1.275 to 1.285 measured by hydrometer. Industrial Level Antimony is 6% by weight and is accepted for industrial deep cycling and enhanced recovery. Plate thickness is approximately 43% greater than low antimony plates. Battery capacity ratings are based upon an ambient temperature of 77°F (25°C). Cycle life: 1500 cycles @ 80% depth of discharge cycles; 5000 cycles @ 20% depth of discharge cycles. The minimum or final cell voltage is 1.70 VPC. Call for your freight on these top-end batteries! Units ship from California, and generally have a 2-3 week lead time. Other notes on these fabulous batteries: these are heavy duty, deep cycle, high recovery, industrial type cells. You'll need six of these for a 12V system, 12 for a 24V system, etc. Special packaging is available for export shipment, add $200 per pallet to list price plus shipping. Batteries available "dry charged" (no electrolyte), add 17% to list price. Fewer than 6 cells, plastic or steel case adds $45 charge per cell; otherwise that's included for a 6 cell (or more) purchase. Please check out our other battery offerings, Solar-One deep cycle batteries, Concorde Sun Xtender® batteries, Lithium Ferro Phosphate LFP battery, and our new Iron Edison Battery. HOW TO SIZE YOUR BATTERY BANK: there's a fairly simple formula for figuring how many of what kind of batteries you need for your power requirements. Here's how it goes: first, you need to know how many watt-hours per day you need for your power system. That is simply square one! Then, you take that figure time 1.3 - the fudge factor (as batteries and other components aren't 100% efficient) to get your "adjusted watt hours needed per day". Now that you know that, take your adjusted watt-hours per day times the number of days of battery storage you'd like (we usually use at least a minimum of 3 and as much as 14); then take that number times 2 (for 50% depth of discharge--you never want to take your batteries lower than that), then take THAT number divided by your system voltage (probably 12, 24 or 48V)--and that equals the number of amp hours of storage you need. So let's use a figure--say you need 5000 watt hours per day; times 1.3 = 6500 "adjusted" watt-hours; take 6500 times 4 (for four days of storage) = 26000 X 2 (for 50% depth of discharge) = 52000; divided by 24 (system voltage) = 2166 amp hours of storage. 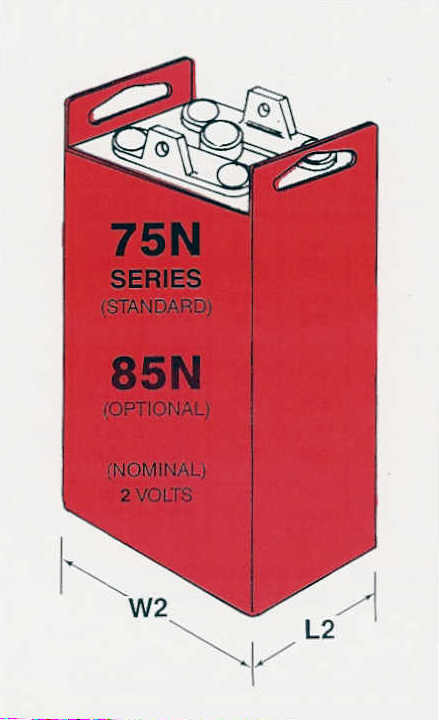 NOW, if you need 2166 amp hours of storage in a 24V system, and you plan to utilize the Surette batteries (above), divide 2166 by 460 equals 4.7...well, you can't have 7/10th of a battery, so you'd round it to five. And since it takes four 6V batteries to make a set in a 24V system, you'd need 20 of the Surrette S-460 batteries to give you 5000 watt-hours a day, for four days, to 50% depth of discharge. END OF LESSON. Questions? Call me at 406-777-4321 or 777-4309. WHAT TRUCK FREIGHT ENTAILS: The best rate for truck freight shipping is to have you pick it up at the local freight terminal or commercial drop point. A residential delivery is usually $40 to $45 more than a business delivery, and a lift gate (which drops the goods off at ground level), is another $80 to $100 in additional fees. Inside delivery is an additional cost on top of that.